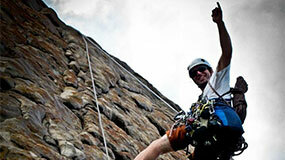 We run half or full-day tours, as well as offering team building, group outings and climbing tuition. Our half day tours combine Rock Climbing with abseiling, or Caving and abseiling, and our full day tour takes in all three activities. Head out to the cliffs or into the forest, enjoy some of the wild South West’s most spectacular scenery and hidden treasures, fun for everyone from teenagers to grandparents – the only problem is choosing which adventure to tackle first!